Radical anti-draft haredi group vows to launch wave of protests after plainclothes policemen arrest faction member for draft dodging. 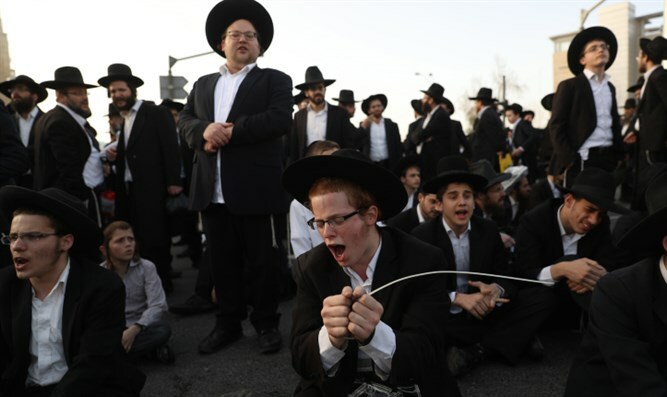 The extremist Yerushalmi Faction (Jerusalem Faction) vowed to launch a large-scale protest on Friday after a haredi yeshiva student was arrested for draft dodging, Kikar Hashabbat reported. The student, Yisrael Meir Elyashiv, was arrested in Moddin Illit on Thursday by plainclothes policemen for refusing to show up at the IDF's recruitment center in order to receive a draft deferment. Elyashiv is currently imprisoned in the IDF's Jail 4 in Tzrifin. "By the orders of our holy rabbis, will gather on Friday night, the masses in all the major cities, for a tremendous Kabbalat Shabbat on the streets of a city, in order to cry out against the continued abuse of yeshiva students and their placement in the military prison," said a statement released by the faction. The statement added that leaders of the group will meet with rabbis next week "to accept their decision regarding the continuation of the struggle against the criminal detention". The Jerusalem Faction, which was founded by the late Rabbi Shmuel Auerbach, has demanded the IDF issue blanket exemptions to all haredi men, and has rejected the present system, under which full-time yeshiva students are granted draft deferments, renewable each year. By law, every Jewish Israeli must register for the draft before the age of 18. Anyone who brings a letter from his yeshiva head is given an automatic deferment for as long as he remains in yeshiva. However, those belonging to the Jerusalem Faction refuse to register, and therefore do not receive their legal deferments, placing them at risk of being arrested for draft-dodging.